Rediff.com » News » Patna blasts: Was Modi target of IM's 'Operation Machli 5'? 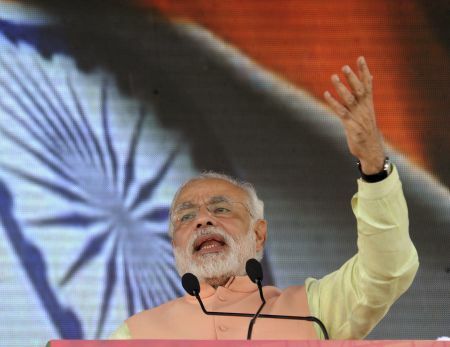 Patna blasts: Was Modi target of IM's 'Operation Machli 5'? The National Investigation Agency team, which has taken over the Patna serial blasts case, has a huge task ahead of it. Firstly, the investigators need to probe if the Indian Mujahideen allegedly carried out the blasts ahead of Narendra Modi’s rally at the behest of a local political wing. Sunday’s attack was no small operation and required accurate planning by conspirators. Sources say that Modi was the target of the attack and this operation was codenamed Machli 5. Sources in the NIA told rediff.com that the IM had planned to hit a major target. The operation was chalked out over the past month. But the NIA seems to have been caught unawares. “At no point during the interrogation did Yasin Bhatkal or his associate Assadullah Akthar make any mention of this operation. In fact, they answered all questions on Bihar carefully,” an NIA official, said. “Modi has been campaigning across India since he was announced as the Bharatiya Janata Party’s prime ministerial candidate in September. But there was more hype around his Patna rally because of his rivalry with Bihar Chief Minister Nitish Kumar. Hence, Patna was chosen as the target as the IM was aware it would create a lot of flutter,” he added. According to investigators, IM operatives who planted the blasts in Patna enjoyed the support of local leaders who helped them move around the city with ease and plant the explosives. While the police said that IM’s new Ranchi module was behind the blasts, the NIA said that this cell appears to be a pseudonym. The entire operation was planned by the Darbhanga module with the help of cells from neighbouring Samasthipur, Madhubani and Madhepur. If Yasin’s confessions are to be believed, the locals in Darbhanga offer the IM a lot of support, as he his married a girl from the town. He is treated as the “son-in-law” of Darbhanga. NIA sources said that IM operative Tehsin Akthar, the prime suspect in the blast, was in touch with local politicians from Darbhanga and Samasthipur. There are 100 IM operatives living in these Bihar towns, according to the Intelligence Bureau. They lead regular lives and only during an operation they don roles as operatives of a terror module. This makes it even more difficult for the NIA to probe an operation. Not only the locals but also the police are not helpful. In, Bihar the problem begins with top bureaucrats. Nitish Kumar has accused investigation agencies of carrying out undercover operations without informing the local police force. However, both the NIA and police officials from other states pointed out that a case becomes tougher to crack if the local authorities are kept in the loop. There are too many moles in their set up, a Bangalore police officer said. “What the CM says has a bearing on the police force in the state and even if they want to reach out to us they are helpless,” he added. Intelligence agencies also pointed out that alerts given to the Bihar police are not taken seriously. Prior to the Bodh Gaya blasts two alerts were issued and the same was the case ahead of the Patna rally. But the Bihar police disagreed. They said that none of the alerts were specific in nature. Patna serial blasts were planned to coincide with Modi rally? Carrying out Patna blasts cost just Rs 40,000?